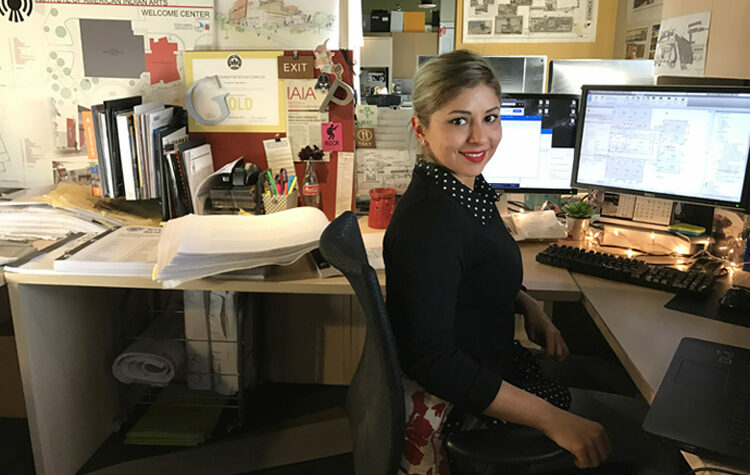 We sat down with Vanessa Garcia, one of the Project Architects at DMA, to talk about her role as an architect, where she looks for inspiration, and what a typical day-in-her-life is like. 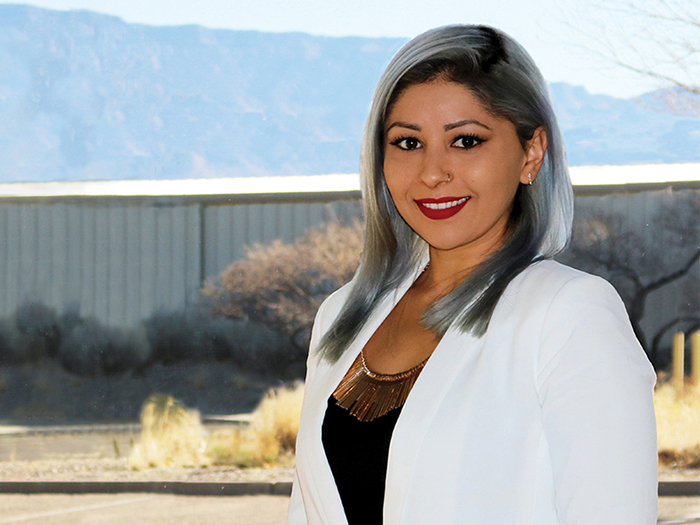 In her 8.5 years with the firm, Vanessa has worked on a range of projects from small renovations to multi-million dollar developments, bringing a hands-on approach to the production of each project. Vanessa’s bright personality (and hair!) 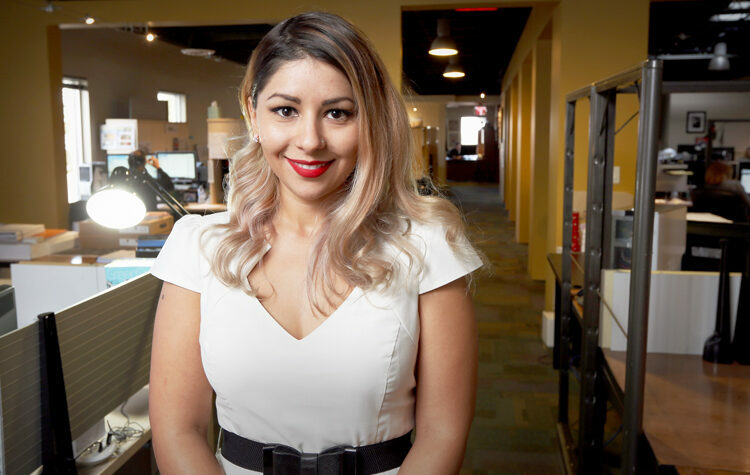 brings a unique and vibrant energy to the DMA team. Q: How would you describe what you do as an architect in a few sentences? A: 2 words: Problem solver. Each project has its own individual set of constraints and requirements. Basically my job as an architect is to try and solve the puzzle and make it come together in a coherent, functional, and beautiful way. Q: What is your favorite part of working at DMA? A: The ability to design, select finishes, and render the projects I am working on. I like being hands-on and really involved in the production of my projects. It is what I love to do and it’s why I became an architect. That, along with working in a collaborative design team is so important to me and makes me happy. A: Institute of American Indian Arts Multipurpose Performing Arts and Fitness Center, Navajo Tribal Utility Authority Headquarters, Chinle Nursing Home, Tuba City Long Term Care. Q: What has your favorite project been so far? Why? A: One of my favorite projects I have worked on was a renovation of a historic house for CNM, because it was small scale, quick, and the final product was exactly what we had envisioned. It was a unique project because we were working with a historic house, but adding a post-modern aesthetic and re-purposing it as office and meeting space for their STEM department. Sometimes it’s the smaller projects that can be a lot of fun and really allow us to focus on neat design details. Q: What is your favorite part of the work day? A: My favorite part of the work day is really any time I can just have my music on, focus on what I’m doing, and be in my creative zone. That may be sketching design ideas, selecting materials and finishes, BIM production, or rendering. Q: What made you want to pursue architecture? A: I’ve always been interested in good design and beautiful architecture and I liked the idea of being able to create art that people function in and use. Architecture is both technical and artistic, challenging but rewarding, and there’s a real observable progression from start to finish. Ultimately seeing your design come to fruition is really cool and it becomes a standing testament to all the hard work you and your team put into the project. Q: In your designs (work), where do you find inspiration? A: I find inspiration from a lot of things…from art, from other architectural works, from digital design, furniture design, fashion, nature, and culture. Q: Who or what motivates you? A: Architects that I look up to and hope to be as good as one day. Also my family, my dogs and my faith. I always want to push myself to get better and produce work I’m proud of. And certainly, hearing your client say “We love our new building!” is always the goal and is satisfying to hear; it means you and your team were able to take their vision and make it a successful reality. A: I’m a gamer…I like video games! Q: What advice would you give to people starting off in the industry today? A: You have to find something in the job that you truly love to do and do it as much as you possibly can, because like any other profession there are parts about the job that are tedious and not much fun but that you have to do, and it’s only the stuff you’re passionate about that makes you happy and keeps you going.